For 20 years, Google has built products, platforms and services that help people and businesses grow. Last year we launched Grow with Google to continue to carry out that mission, by making digital tools and training available for everyone. We recently took Grow with Google to Brazil, where the economy has struggled to bounce back from its worst recession in recent memory, resulting in high unemployment across the country. Despite this economic hardship, there's been no shortage of creative ideas and people who want to use technology to bring their ideas to life. 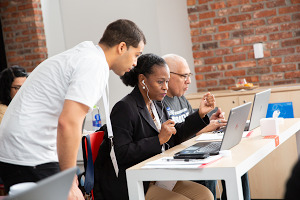 Knowing that Brazilians need new skills to thrive in an increasingly digital world, Grow with Google went to six cities around the country to reach small business owners and job seekers, educators, women and journalists. The turnout surpassed even our wildest expectations. In all, more than 45,000 people packed auditoriums and soccer stadiums for a total of 80 hours of training sessions on our Grow with Google tour, which included stops in Teresina, Brasília, Natal, Salvador, João Pessoa and Fortaleza—all cities with high unemployment, but lots of opportunity. 3,000 people at a Grow with Google session in Brasília. Technology can play a key role in helping to reduce gender inequality, so Womenwill—our initiative to create economic opportunities for women—was an important part of our Grow with Google roadshow in Brazil. Since we kicked off the campaign earlier this year, nearly 7,000 women have undergone training in leadership, negotiation techniques and digital marketing. As we train the next generation of female entrepreneurs, we brought in two women who are already making a big difference in Brazil. In Brasília, we heard from Carmen Lúcia—the second woman to preside over the country's Supreme Court—about the importance of education on the path to gender equality. And in Fortaleza, Maria da Penha—a women's rights activist who inspired the passage of stricter legislation in Brazil for domestic violence—shared thoughts on how women must take advantage of every opportunity to stand up for their rights. The most profound part of the Grow with Google workshops is seeing what people do with the new skills they’ve learned. Kalina Veloso proudly shows off the magazine she created. 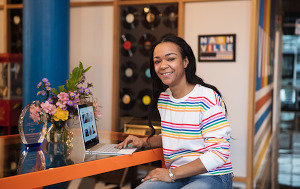 It’s only been a few months since the workshops, but we’ve already seen early signs of success: Kalina Veloso, who attended the Natal session in June, left the workshop determined to move forward with her dream of creating magazine focused on women entrepreneurs. By August, it launched. Samantha Myranda, a school teacher for autistic children in the northeastern city of Fortaleza, is now using YouTube videos for her sign language lessons. Entrepreneurs Risoaldo Nobrega and Marcelio Jeferson–owners of a small marketing agency—traveled five hours to attend our digital skills session, which has helped boost businesses in their hometown Icó, in the state of Ceará. The Grow with Google tour left us even more resolved to pursue our goal of bringing the transformational power of technology and education to people everywhere. And now that the roadshow is over, we’ll be lighting some birthday candles from Brazil!